These rocker shaft bushes are from our own exclusive Yorkshire based manufacturing source. 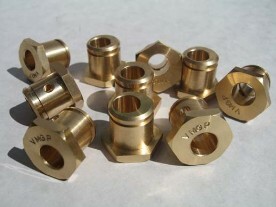 The bushes are precision CNC machined and of aircraft quality brass alloy. They are made solely for Vintage MG Parts. We have studied previous reproductions of this part prior to setting our own agenda to incorporate improvements. Vintage MG Parts have added more machining operations to this product. They are made out of a high grade brass alloy and have been machined and reamed to circa 1/1000th inch over size for the rocker shaft bore to provide a perfect tolerance between the bush and the shaft when the rocker finger pinch bolt is tightened up. The bush will always marginally crimp up over the shaft and it is good practice to hand ream following fitting of the finger if required. 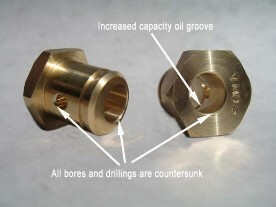 In addition, the standard size of the oil groove has been increased and having studied previous reproductions we opted for all radii to be countersunk on all bores to eliminate burring. In one of our engines, we have used reproduction alloy alternatives. It is worth noting that whilst these are being retailed at a higher price than our product, there is no benefit to be offered apart from a nominal weight loss. They have also attracted adverse commentary over the years in that they do not retain the strength quality compared to the brass alloy alternative as they can readily 'crimp' onto the rocker shaft if the finger is marginally overtightened. This then creates excessive wear to the bush, fingers and cam. Please note, our latest and largest batch (February 2010) of Yorkshire CNC'd bushes now incorporate a reduced width circlip groove of 1.20 mm. Our previous engraved bushes take a 1.40 mm width circlip. Our bushes are suitable for J, P, L, N and K Types. The M, D and F Types as well as OHC Morris Minors used an early style rocker finger which is no longer available. However, the later style rocker fingers are widely available and our bushes complement this component.